Can It Be Good For You? Can the tea caffeine be your good friend? What's the optimum number of cups of tea to drink in a day? Tea versus coffee. "Does it contain any caffeine?" The short answer is "yes", but the real story is slightly more complex. What I can assure you is this: after you have read this article, you will love your tea even more! You see, tea is far more complex than coffee. Tea caffeine acts in a way that mystified first time drinkers. The relationship between tea and caffeine is paradoxical. Higher quality tea contains higher levels of caffeine. But, contrary to expectation, these teas are usually soothing, rather than stimulating. Would you be interested to know why caffeine, and especially caffeine in tea, can be your good friend? 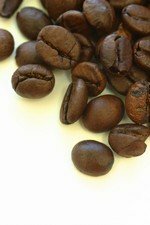 Caffeine is a plant alkaloid found in coffee, tea and cocoa. It acts as natural a pesticide, protecting plants against certain insects that feed on them. Moderate consumption of caffeine is beneficial to health. A 2006 study conducted by Paganini followed 13,624 Californians for 23 years from age 74 onwards. They found that people who consumed moderate amounts of caffeine have a significantly lower risk of death. Paganini defined 200 to 400 milligrams of caffeine a day as moderate. Ever wonder why Asians are less likely to develop senility? Some people speculate that drinking tea makes the difference. A large body of research now suggests that tea reduces your risk of developing Parkinson's disease - probably as a result of caffeine's ability to modulate adenosine A2A receptors in the brain. For the weight conscious, caffeine synergizes with tea polyphenols to increase calorie loss and fat burning. The key is to drink a "moderate" amount of caffeine, and not remove it altogether from the diet. Consuming too much caffeine can be harmful. Remember, caffeine is found in soft drinks, energy drinks, chocolate and energy mints, as well as tea and coffee. How do you know you are consuming too much caffeine? The side effects are restlessness, irritability, sleeping problems, tremor, heart palpitations, loss of appetite, upset stomach, nausea, frequent urination and skin rash. The UK Tea Council recommends drinking not more than 6 cups of tea or 300 milligrams of caffeine a day as being safe for most people. This is sound advice. The Paganini study showed that 300 grams of caffeine a day are optimum and reduce risk of death. If you are a coffee drinker, consider switching over to green tea! The generally accepted rule of thumb is that tea contains half the amount of caffeine in coffee. Unlike coffee, tea chemistry is far more complex. It contains catechins - a major class of antioxidants and theanine - a feel-good compound that promotes concentration and relaxed awareness. Catechins and theanine interact with caffeine in hot water to form more complex compounds. They act together to increase tea health benefits and reduce its caffeine side effects. Such is the wonder of Nature. Caffeine is generally a safe substance to consume. There hasn't been a reported case of someone dying from over-consumption of caffeine. You would really have to consume a very large amount for that to happen. However, special situations do apply. You may be more sensitive to caffeine than others. If that is the case, start by drinking a small amount of tea daily. Let your body adjust to this wonderful beverage slowly. As far as I am aware, scientists have not found any problems with one-half cup or less than 75 milligrams of caffeine a day. If you are pregnant, it is best to avoid drinking caffeinated tea altogether. For further information, read the article on Green Tea and Pregnancy. Finally, if you have a medical condition, please exercise caution. Tea is complex. It has more than 200 bioactive substances. While overall it has many health benefits, these chemicals, when acting on their own, often have negative effects on the body. If you have a medical condition and have been advised by your medical advisor to reduce caffeine intake, please exercise caution. Ask them to clarify what they mean. For further information, please read the article on Green Tea Side Effects. Wikipedia, The free encyclopedia. Caffeine. Paganini-Hill A, Kawas CH, Corrada MM (2006). Non-alcoholic beverage and caffeine consumption and mortality: the Leisure World Cohort Study. Prev Med. 2007 Apr;44(4):305-10. Epub 2006 Dec 29.